I have so many good memories of my days working with my friend Nancy at the Culinary Center of Kansas City, but one of the things I enjoyed doing the most was the series of "Bistro Dinners" we prepared together. We usually cooked 2 or 3 Bistro Dinners a month. These dinners were open to the public and were served at long family-style tables. They were always fun and festive. Generally, we prepared four courses...and there was always a particular theme. We did special holiday themed dinners...regional and seasonal dinners...and ethnic dinners of all kinds. Because we covered so much food territory during the preparation of these meals, I was exposed to a lot of foods and traditions that I might not have ever experienced otherwise...Nancy created some very fun and interesting menus. I was reminded of all of this recently when I was bouncing ideas off of Nancy for an upcoming Valentine's Day dinner class. 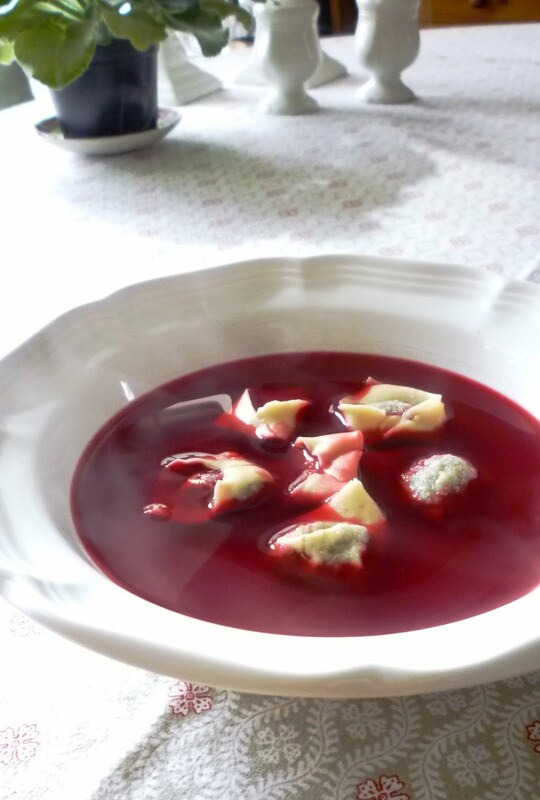 Nancy suggested that I resurrect a Polish Borsch that we had served at a Christmas bistro dinner. I remembered this particular dish because it was so elegant and beautiful....a clear, deep red broth with tiny mushroom dumplings...called uszka...floating in it. And even though this dish is traditionally served in Poland for Christmas Eve, I agreed that it would be just the thing as a first course for Valentine's Day. I have not altered the broth recipe that we used at all (I think it was from Saveur Magazine...but I'm not really sure). It is simple and delicious...and very easy to make. Even so, I do have a few pointers to share: First, the seemingly large amount of lemon juice is correct. As I looked at the recipe again, I was dubious. But the acidity of the lemon sets the deep, bright color...and, just as importantly, balances the sweet, earthiness of the beets. I have seen recipes that use vinegar instead, but I can't personally vouch for these. If you would like to try vinegar, use half as much. Secondly, keep all of the vegetables in very large chunks....or whole...and don't boil the broth hard. Cutting the vegetables into small pieces and/or cooking at a hard boil will make for a cloudy broth. It isn't really even necessary to boil the broth. After it comes to an initial simmer, it should just be kept at what I would call a bare simmer. An instant read thermometer will read somewhere between 190° and 200°. Then, if time allows, let the broth sit and cool at room temperature for a couple of hours. Better yet, chill the broth—before straining the solids out—over night. When made this way, the final flavor of the broth will be full and developed. The mushroom filling I used in the dumplings is a mixture of cooked dried porcinis and fresh criminis. I have seen recipes that use all fresh or all dried, but I like a mix. Using mostly fresh saves a bit of money....and using a small amount of dried amplifies the flavor. A lot of recipes insist on all porcini (fresh and/or dried), but I have seen more than one recipe that says the dumplings are traditionally made with whatever mushroom is available. No matter what kind of mushroom you use, cook them until all the moisture has been released and has evaporated. If the filling is runny or wet, the dough will become soggy as it leaches the moisture out of the filling. The filling includes bread crumbs to help absorb any moisture that might remain. The dough that is traditionally used to make the dumplings is very similar to fresh Italian pasta. In fact, the dumplings are basically the same thing as tortellini. Italian noodle dough is made of eggs and flour. The traditional polish dough substitutes water (sometimes milk) and a little oil for some of the egg. Because I like the all egg dough I usually make, that's what I use when I make the uszka. 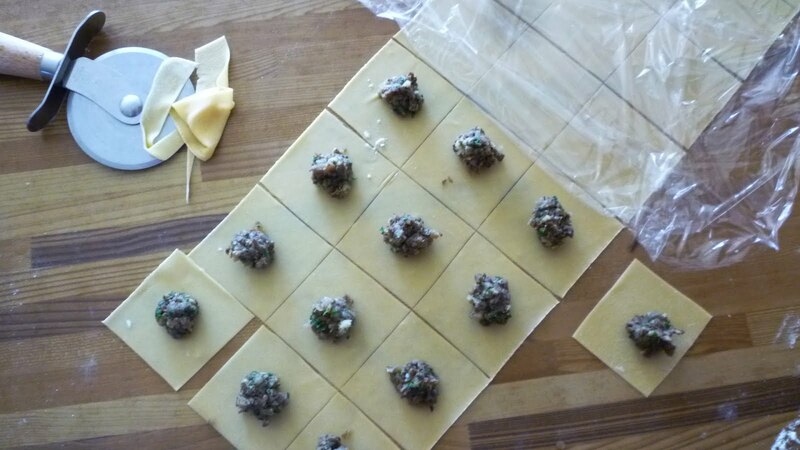 If you don't want to make the dough at all, you may use purchased wonton wrappers instead. If you have never made pasta before, check out my post on fresh spinach pasta from several years ago. As noted at the bottom of that recipe, the method for plain pasta is the same. 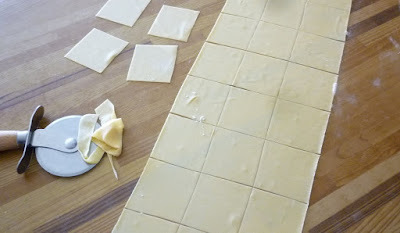 The only difference is that the sheets of dough are rolled more thinly—you should be able to see shapes and patterns through the sheet of dough—and the dough is cut and filled immediately after rolling into sheets (whereas pasta sheets that will be cut into ribbons are allowed to sit out until they lose some of their moisture and begin to feel somewhat leathery). While I was experimenting with the uszka, I decided to make a quick little lunch one day...serving the uszka Italian style. It was so good I wanted to share it here (although you can find recipes just like this all over the web). 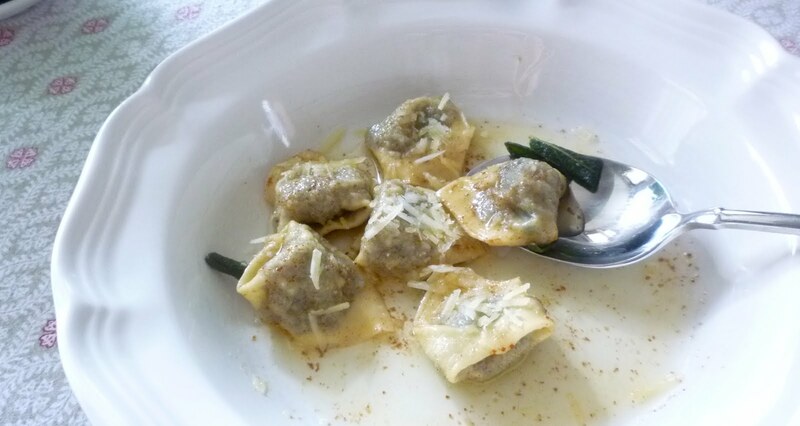 I simply sauced some of the cooked uszka...more appropriately called mushroom tortellini in this guise...in some browned butter with fried sage and lemon. I topped the dish with a mix of grated Parmesan and Pecorino. It was delicious and would be worth making the uszka simply to have them like this. Just like the Borsch, I think it would make a wonderful first course for a dinner with friends. Put the beets, carrot, parsnip, leek, bay leaves, lemon juice, allspice, peppercorns, porcini, and chicken stock in a large pot, and add 8 cups of cold water. Bring to a gentle simmer over medium heat, then reduce heat to medium-low, and barely simmer for about 2 hours (the temperature should hover around 190°). Remove from heat and let sit for 2 hours. If time, chill overnight to allow it to steep even further. Strain, and discard the solids. Add water to make 6 cups broth. Return beet stock to the pot and bring back to a simmer over low heat. Correct the seasoning with salt, pepper and more lemon as necessary. Place 6 cooked uszka in each of 6 to 8 individual soup plates, and pour the hot borsch over the uszka. Serve immediately. Transfer porcini to a small pot, then strain soaking liquid through a coffee filter (or damp paper towel) into the same pot. Simmer over medium-low heat, adding water as necessary, until porcini are tender, about 2 hours. Remove porcini from the pot, finely mince, and set aside. Strain the cooking liquid into the Borsch. Place a scant teaspoon of filling in the center of each square, lightly dampen the edges with water, then fold bottom corner to top corner, pressing gently from the top down the sides to remove any air pockets. At this point they should look like triangles. Fold the right and left corners over each other, and pinch them between your thumb and forefinger so they hold together. Set the uszka on a semolina dusted sheet pan, making sure they aren't touching, as you form them. The uszka may be cooked right away, or they may be stored for up to 24 hours under refrigeration. To store, allow them to dry slightly, uncovered, at room temperature, for about an hour. Then, cover them loosely with a linen or paper towel and wrap the sheet pan tightly in with plastic wrap and transfer to the refrigerator. Cook uszka in batches in a large pot of gently boiling salted water over high heat, until the pasta is al dente...about 3 to 4 minutes. Remove from the pot with a slotted spoon, transferring them directly to serving bowls or placing them on a lightly oiled baking sheet where they may be kept, lightly covered with plastic wrap, until ready to serve. Chill if not serving within an hour of cooking. Note: Although not ideal, the uszka may also be frozen for up to a week. Place the sheets with the uskza in the freezer and when they are frozen hard, transfer to ziplock freezer bags and seal. When ready to cook, spread them on a semolina dusted sheet and let them thaw, uncovered. This will only take about 20 minutes. Cook as for fresh. Mound the flour on a counter top and make a well in the center. Crack the eggs into the well and break them up with a fork. Gradually begin incorporating flour from the walls of the well into the eggs. When the walls start to collapse, begin using a bench scraper to cut the flour and liquid ingredients together. At first the dough will seem an unmanageable, shaggy mass. Begin to work the dough until you have a cohesive mass that you can knead without it sticking to your fingers. This initial formation of the dough will take about three minutes. If at the end of this time there is unincorporated flour remaining, sift it to remove any bits of dough. Set this sifted flour aside to be used for the remainder of the kneading process and wash your hands to remove any caked on bits. Continue to knead the dough (adding flour if the dough is sticky) for 10 minutes until the dough is satiny, smooth and elastic—with no trace of stickiness. Wrap in plastic and let rest for 30 minutes to 3 hours. Alternatively, place the eggs and flour in a mixer fitted with a dough hook. Begin to mix on the lowest speed. When the dough begins to come together, increase the speed to medium and knead for 10 minutes. To roll out the dough using a pasta machine, work with half of the dough at a time. Flatten the dough into a thick disk and flour lightly. Starting with the widest setting, pass the dough through the rollers six to eight times or until the dough firms up, folding it in thirds each time and turning the dough so an open end feeds into the roller. Continue to lightly flour the dough as you work. Set the rollers at the next, narrower setting and pass the dough through two or three times or until the dough is almost the width of the roller, folding in half each time and passing through the rollers folded edge first. Set the rollers for the next, narrower setting and pass the dough through, but do not fold it. Run the dough through at each successively narrower setting, until the desired thickness is achieved. Note: This recipe makes almost twice as much dough as you need to make 50 uszka...I would have written the recipe for half quantities, but this leaves no wiggle room for differences in how people roll out dough. I would prefer not to cut it so close. Place butter in a small saucepan and melt over medium heat. As the butter continues to cook it will bubble and spatter. When the spattering begins to subside, watch the butter very carefully—the milk solids will brown very quickly at this point. When the solids have turned a nice golden brown, remove the pan from the heat. Add the sage leaves and let sizzle briefly until they crisp. Cool the pan down by dipping in a shallow pan of cool water, or by adding a few drops of cool water to the butter and swirl in. Season the butter to taste with lemon juice and salt. It will take a fair amount of both—don’t be timid. Set aside while you cook the tortellini. 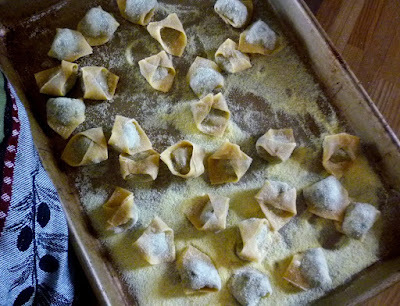 Drop the tortellini in a large pot of gently boiling salted water. Cook until the pasta is al dente...about 3 to 4 minutes. Remove from the pot with a slotted spoon, transferring them to the pan of warm browned sage butter. Toss to coat in the butter, adding a splash of the cooking water to extend the sauce if necessary. Divide the tortellini among 4 plates. Scatter some freshly grated Parmesan or Pecorino over and serve right away.